Bar, Nightclub, Restaurant, and Catering Supplies: Gelatin Shots, Test Tubes, Table Tent Card Holders, Ashtrays, and Many Other Bar Products! Barware - Test Tubes, Gelatin Shots, Neon Serving Trays, Table Tent Card Holders, and More! You can choose from our wide selection of bar supplies and nightclub supplies. 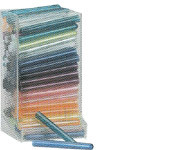 We carry test tubes (tooters), neon serving trays, table tent card holders, a complete line of plastic and glass bar glasses, coat checks, pull tabs, and many other bar items. All our bar supplies are in stock for fast shipment. For our FREE 104 Page Catalog featuring all our items, please contact us at 1-800-233-0828. Our Bandlero Belts are a great way to increase sales and enliven any event. 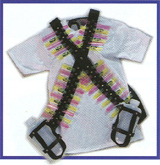 Shot Bandeleors and Test Tube Bandeleros are available in your choice of leather or nylon. Each belt holds approximately 30 shots/test tubes. This 2 gallon Fuzsi Drink Dispenser is ideal for fruit infusions or daily drink specials. It is made of durable clear acrylic plastic. These foam racks help make selling shots a cinch. Each Foam Jello Injector Rack holds one dozen 1 or 2-Oz. Jello Shooters, while the Foam Test Tube Rack holds 40 Test Tube Shots. Our Neon Cocktail Trays are made of durable acrylic plastic. They are available in Lime Green and Tangerine. Each Tray features a non-slip plastic mat on the tray top to prevent items from sliding. Our Neon Serving/Drink Trays measure 15" in diameter. Plastic and Glass Drinkware - Shot Glasses, Palm Hurricane Glasses, Mini Mugs, Shot Hangers, Color-Changing Stadium Cups, and Much More! You can choose from our wide selection of plastic and glass barware, including new light-up and blinking variations. 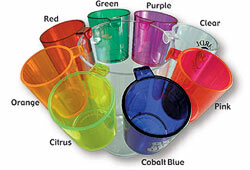 All glasses are available in a range of colors and imprint colors. Fee free to browse our complete selection of Custom-Imprinted Plastic Glasses or Custom-Imprinted Glass Glasses. Precision Pourers help increase bar profits because they feature a unique, patented design to ensure measured pours every time. Each pourer features: 1) a valve along the main cylinder to prevent after drip and eliminate waste 2) a primer ring to channel liquor around the inner ball bearing for a more accurate pour 3) three ball bearings - rather than the industry-standard two - for a smoother, more accurate pour and 4) a new bottom design to ensure that the ball bearings never fall into the bottle. Five colors are available with or without black collars: Rum Amber, Ocean Blue, Crystal Clear, Shamrock Green, and Watermelon Red. 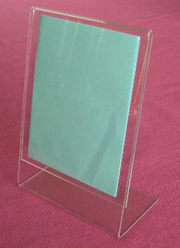 These Table Tent Card Holders are made of clear plastic and feature matte-finish edges. Choose from open-top table tent card holders, open-bottom table tent card holders, and easel style table tent card holders. - 4 X 5 in. - 4 X 6 in. - 4 X 9 in. - 5 X 7 in. - 5.5 X 8.5 in. - 8.5 X 11 in. Test Tubes - Available with Your Design and Copy! You can custom imprint these 6-Inch Crystal Plastic Test Tubes with any design you choose. 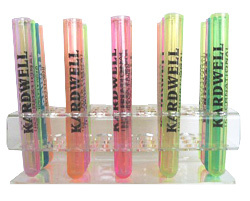 Test Tubes are available in clear, ruby red, sapphire blue, and emerald green. The minimum order is 1,000 Test Tubes for all custom orders. Stock/blank Plastic Test Tube Shots are available at a low 250 pieces. Please feel free to scroll down the page for tooter racks in 24-, 32-, 36-, 44-, and 48-hole capacities. This bar back test tube dispenser allows for easy storage of approximately 125 Test Tubes. Made of clear acrylic, each dispenser comes with a secure lid to help keep the tubes secure and clean. These 32 oz. 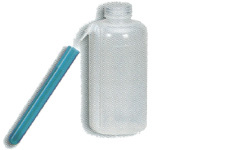 Filler Bottles are made of a durable, squeezable plastic. Each bottle features a specially designed spout, which prevents spills and allows for easy filling of Test Tube Shots. These clear Plexiglas Test Tube Racks help optimize shot sales. Choose from 24-hole tooter racks, lighted 32-hole tooter racks, 36-hole tooter racks, and 44-hole tooter racks. For additional information, or our Free 104 Page Bar and Nightclub Supplies Catalog, please contact us at 1-800-233-0828.